Submitting your renewal through the states web site is complex. Go ahead and try it for yourself… we’ll wait. So we developed our own user-friendly system that does the thinking for you. We are proud to say, we are the only MA Hoisting Continuing Education provider to offer this benefit to customers. 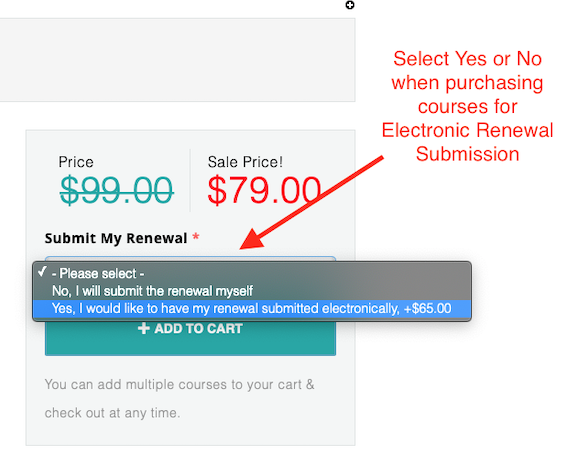 When purchasing any MA Hoisting Continuing Education course, our system will prompt you to select whether or not you'd like to have your renewal submitted through us. This will add the states fee for the renewal ($60.00), plus processing ($5.00) to your shopping cart. Only one renewal is required per person. Our system is built with intelligence, so if you're currently taking any courses with renewal submission already selected, it will automatically know to add any new course(s) to the current renewal. 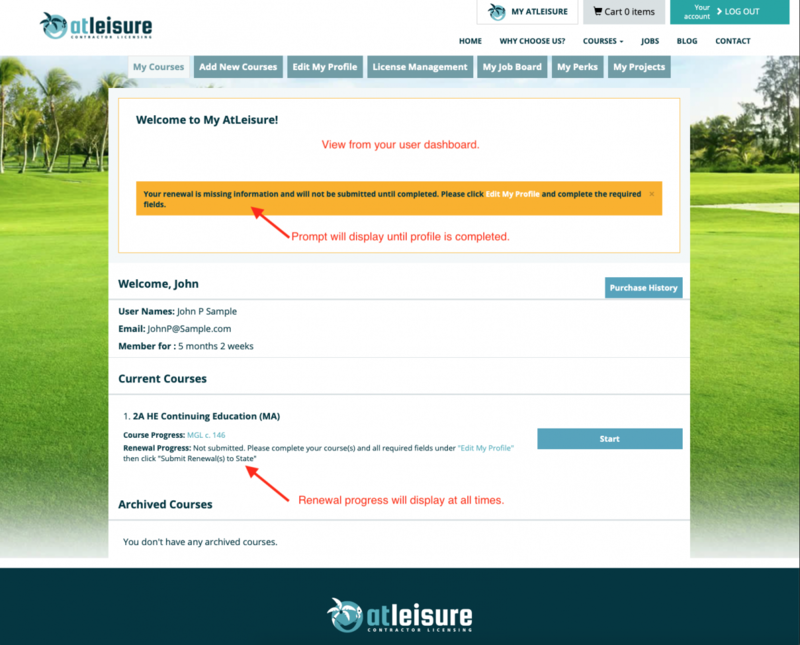 Once purchased, you will be prompted to complete your profile from within your user dashboard. 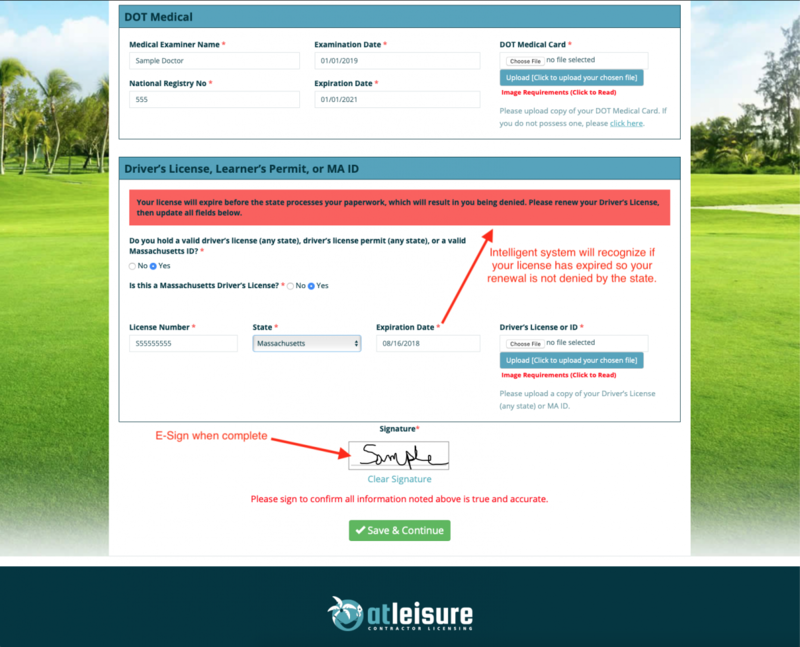 Your renewal progress will display at all times as a notice of where you stand. In order to submit your renewal, you MUST complete all required fields in your profile, and complete all MA Hoisting Continuing Education courses. From your Edit My Profile tab, our easy to use system will collect your required information in sections. You will be prompted to upload copies of your Renewal Form, DOT Medical Certificate, and Driver's License. Renewal Forms generally arrive by US Mail 45 days prior to your hoisting license expiration date. If you are within the 45 day window of your license expiration date and have not received your renewal form, please click here. You have probably heard us say, our system is built with intelligence. So any information added that would cause a red flag with the state will cause a red flag with our system. It's your first line of defense to make sure your renewal goes as smoothly as possible! No image editing software? No problem! 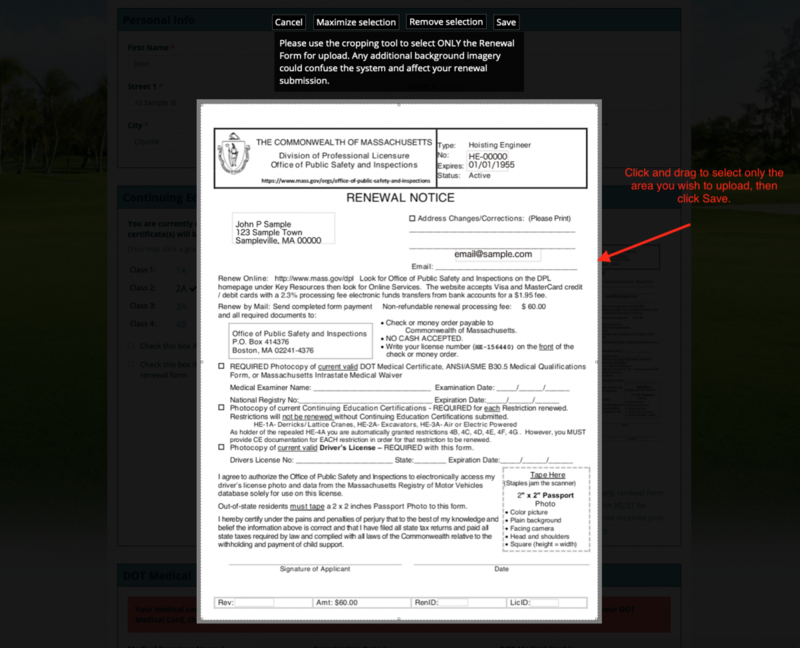 While uploading copies of your Renewal Form, DOT Medical Certificate, and Driver's License, you will have the option of cropping your image using your mouse. Simply click and drag to select only your renewal form. You can even upload a picture taken with a smart phone! 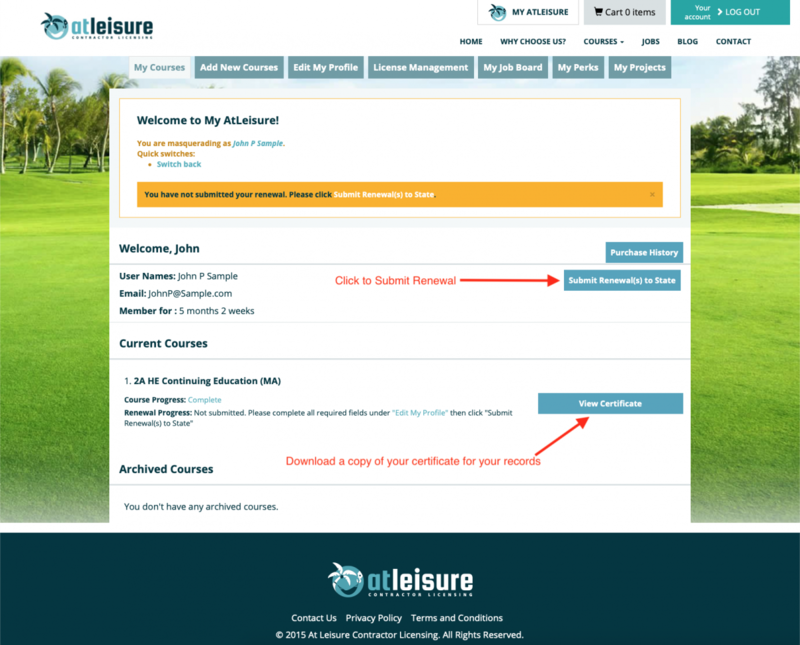 Once your course(s) are complete and all required fields in your profile have been satisfied, you will see a "Submit Renewal(s) to State" button in your dashboard. 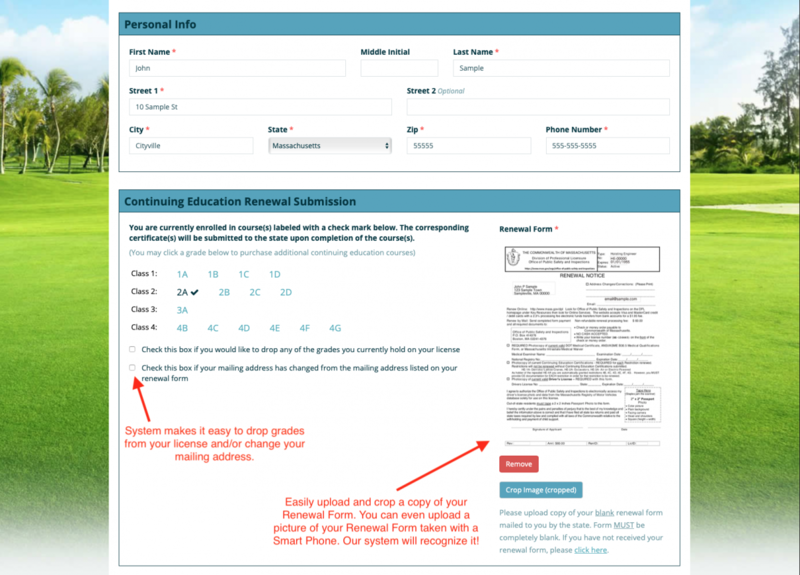 Once submitted, we will send the state your completed Renewal Form, DOT Medical Card, Driver's License, Course Completion Certificates, Headshot Photo (if necessary) and Notice of Grades Being Dropped (if necessary). It's the simplest way to renew your MA Hoisting License and provides you with an easy alternative to using the states web site!